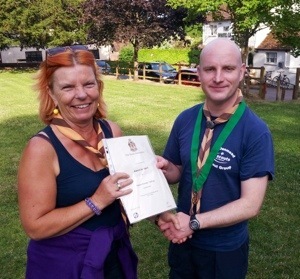 Simon Talling, aka Kaa at Cubs, has been awarded a Chief Scouts Award of Merit. The District Commissioner was hoping to present this to Simon at the Group AGM but Simon was unable to be there, so it was presented by the GSL at Soberton before the Cubs set off on their walk. Simon has been with Denmead Scout group since he was 8 years old and a cub. He moved up through Scouts and Ventures and then became a leader with Concorde cub pack. He is also an Explorer leader with Phoenix and has been one of the mainstays of the group. Well done Simon, this award is well deserved.